I will also provide a compatibility CD that will allow the game to run under ALL VERSIONS of Windows 10, 8, 7, Vista and XP, both 32 and 64 bit. Note that multiplayer mode cannot work. The third chapter in the acclaimed Warlords fantasy strategy series is a textbook case of superb design and implementation. This is the sort of game you won't just play for mere weeks, but one which contains months, possibly years, of grueling strategy and tactics. It's that good. 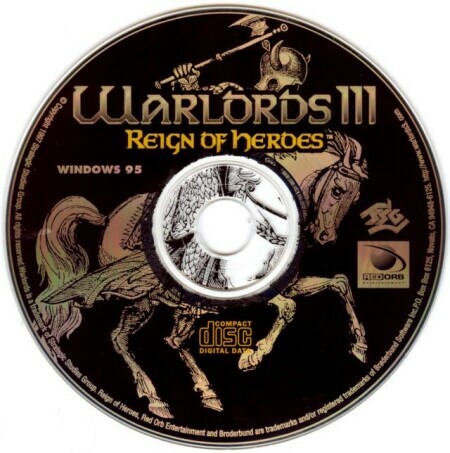 Aesthetically, Warlords III is nothing out of the ordinary though it is a dramatic improvement over its predecessors. The high-resolution bird's-eye-view world maps look realistic and attractive enough, while each of the dozens of military units are imaginative and readily distinguishable. Dispersed throughout the game are beautifully hand-painted scenes depicting each troop type, castle, character, place, and special event. These contribute immensely to the feel of Warlords III, offering that extra sense of detail and involvement, which is nonexistent in most strategy games. Sound effects are sparse but effective, while the music score (composed by Steven Fawkner who designed the game) adds just the right touch of symphonic grandeur. And Warlords III is grand indeed - you will wage war across massive countrysides, with dozens of keeps and castles marking the territories of up to eight separate armies. A friendly tutorial explains the basics of the game in minutes though only time and practice will reveal its nuances. You and your opponents take turns moving your armies, grouping as many as eight units into a single stack. Claiming castles allows you to rally more units, with stronger ones requiring several more turns to produce and demanding more gold for their services. While your instinct may be to produce as many high-level troops as possible, only the proper balance between lesser and greater units will allow you to effectively assault the enemy while adequately defending your perimeter from possible counterattack. An intricate but easy-to-use diplomacy system lets you join forces against a common foe, or find yourself battling against multiple enemies united to do you in. If Warlords III is to be faulted, one would have to cite the abusive unit vectoring system which allows troops to move between friendly castles in exactly two turns. This transfer is invisible, an inexplicable teleport that transcends mountains, water, everything. Though vectoring speeds up gameplay, it downplays factors like positional advantage. The key players in your wars are the hero units who will offer their assistance from time to time for a steep price. These specialized soldiers are stronger and faster than the rest, and can benefit other units with their adept leadership skills. Heroes also gain experience, allowing you to augment their outstanding abilities even further. Some heroes wield magic, which doesn't play a critical role in the game but can sway a battle at that decisive moment. Combat is completely non-interactive, and resolves itself in seconds through a series of hidden number crunches. While those accustomed to real-time strategy games will yearn for more control over their battles, the emphasis in Warlords III is not so much on the execution of a fight as on the preparation. The combat system may seem alarming in its simplicity, but with so many factors at work that determine the odds of success, it is, in reality, not simple at all: Everything, from individual unit strength to agility and morale, plays a role in the outcome. There are countless ways to engage in Warlords III. An epic story-driven campaign as well as stand-alone and randomly-generated scenarios will challenge the solo player, who will encounter a calculating and vicious computer opponent fully prepared to win at any cost. And if you're looking to clash wits with your friends, you may do so via modem or network or even over e-mail. Best of all, you can wage war against strangers from around the world on Red Orb's specialized Internet server. Warlords III is well geared to multiplayer competition, as you can set turn time limits and even resolve turns simultaneously with the opponent - requiring you to work quickly when in close quarters. The options and variables go on and on, as you can construct a custom army, define specific victory conditions, and much more. Warlords III is an intelligent, exciting game - the kind that drives you to play through the night to the break of dawn and leaves you feeling good about it the next day. Its timeless design is easy to learn though robust and sophisticated enough to offer immense depth, limited only perhaps by your cunning. Even its visuals, though not at once striking, are destined to withstand the years. If you long for an intelligent strategy game that offers endless hours of nail-biting tension and terrific warfare, then you cannot go wrong with Warlords III.